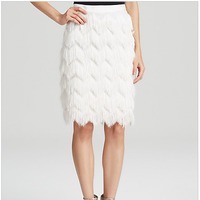 For the girly little fairy that is in each one of us, a white skirt is the ultimate expression of our prettiness. 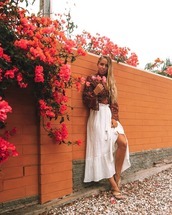 Worn in the summer, when light colors and pastels are the shades of choice, a white skirt is ethereal and becoming on each of us, as fashion icons like Olivia Palermo, Beyoncé and Jordana Brewster know very well. We are not bound to wear short skirts; we can find those that are knee-length, midi or maxi, which Tumblr shows us. Whether our personal tastes lend to cute crocheted skirts or pretty, floaty, chiffon types, we can find one that looks ravishing on us.